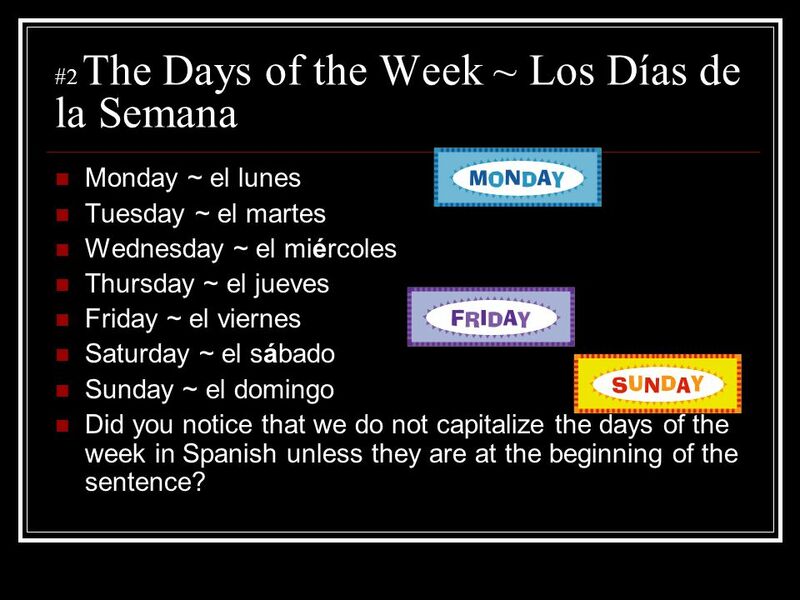 Monday ~ el lunes Tuesday ~ el martes Wednesday ~ el miércoles Thursday ~ el jueves Friday ~ el viernes Saturday ~ el sábado Sunday ~ el domingo Did you notice that we do not capitalize the days of the week in Spanish unless they are at the beginning of the sentence? 3 What day is today? ¿Qué día es hoy? Today is Wednesday. 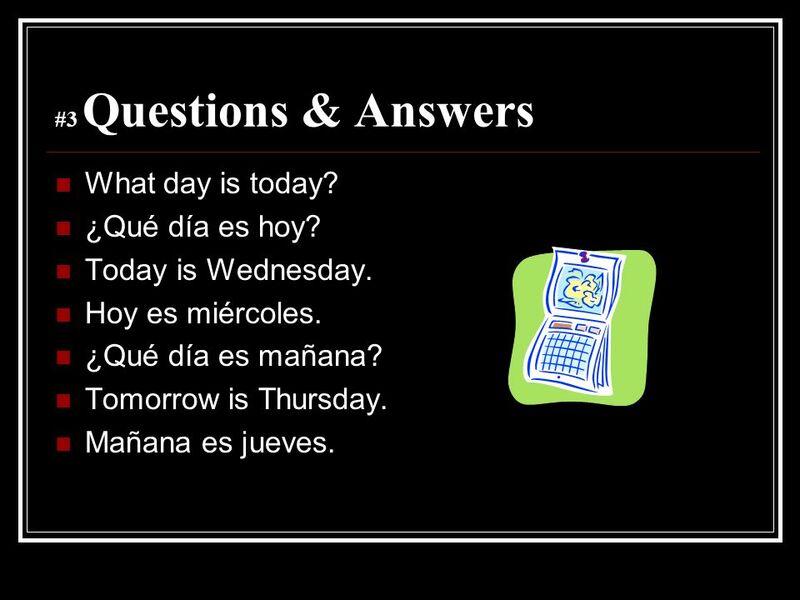 #3 Questions & Answers What day is today? ¿Qué día es hoy? Today is Wednesday. Hoy es miércoles. ¿Qué día es mañana? Tomorrow is Thursday. Mañana es jueves. 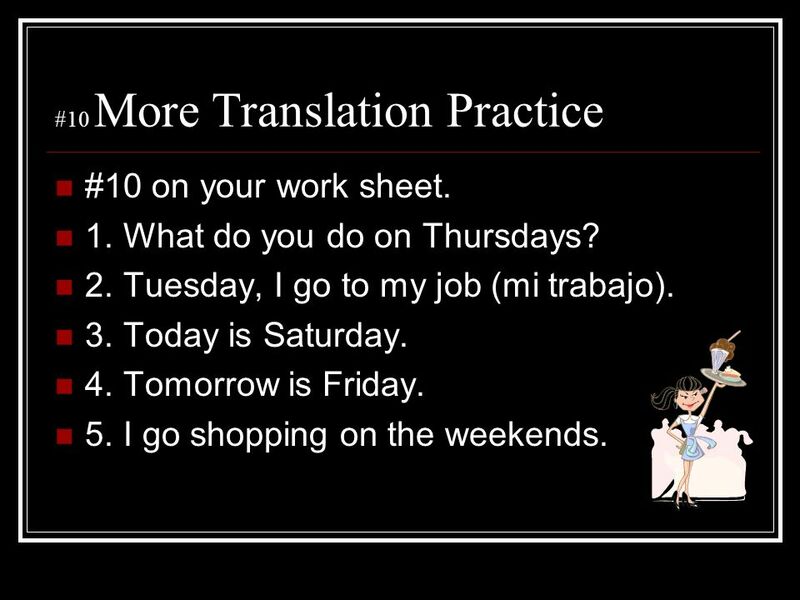 4 Find #4 on your work sheet and write the following in Spanish. 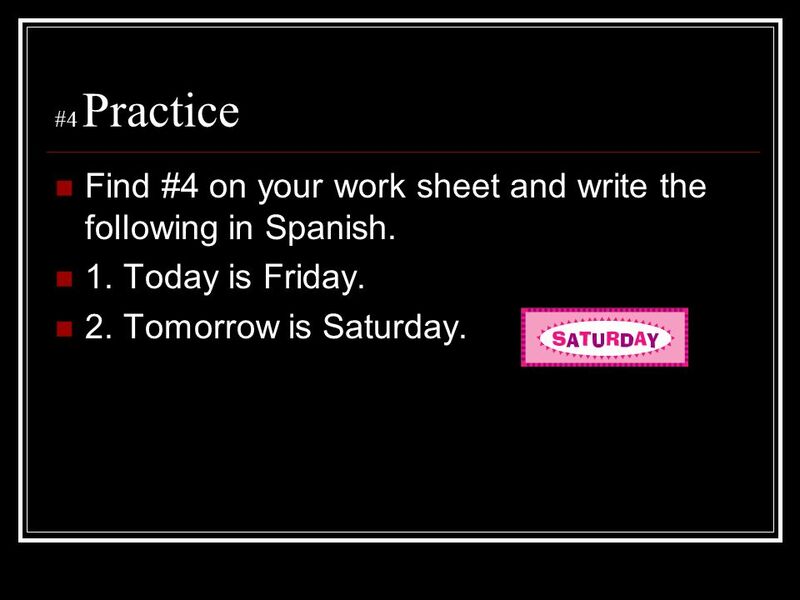 #4 Practice Find #4 on your work sheet and write the following in Spanish. 1. Today is Friday. 2. Tomorrow is Saturday. 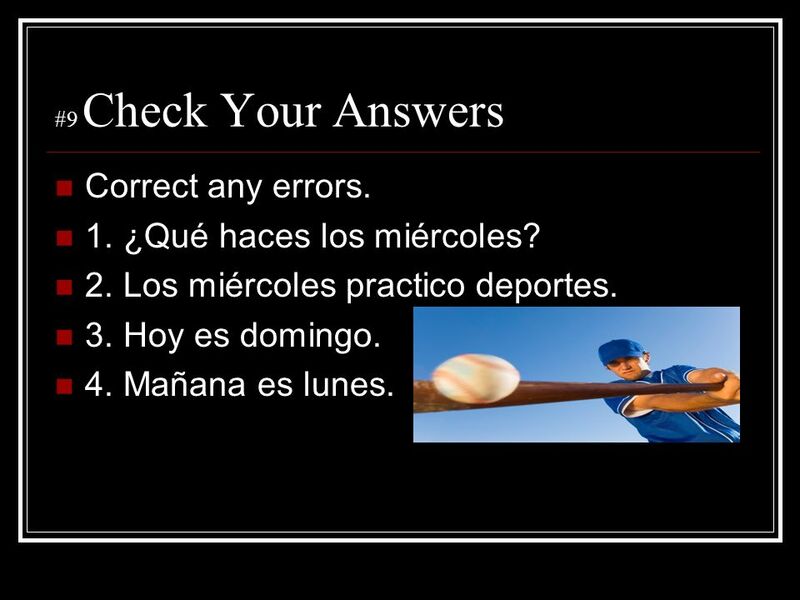 5 Correct any errors that you made. #5 Check Your Answers 1. Hoy es viernes. 2. Mañana es sábado. Correct any errors that you made. 6 El martes tengo un examen. What do you do on Tuesdays? 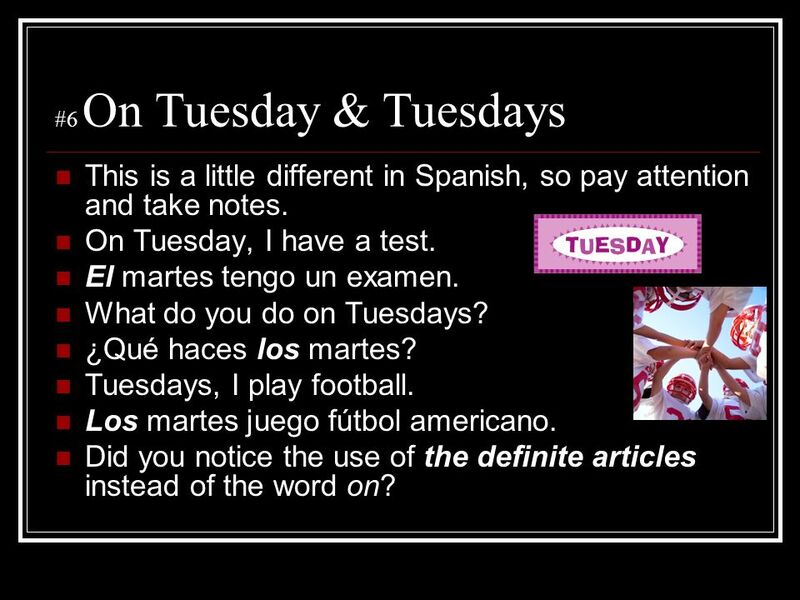 #6 On Tuesday & Tuesdays This is a little different in Spanish, so pay attention and take notes. On Tuesday, I have a test. El martes tengo un examen. What do you do on Tuesdays? ¿Qué haces los martes? Tuesdays, I play football. Los martes juego fútbol americano. Did you notice the use of the definite articles instead of the word on? 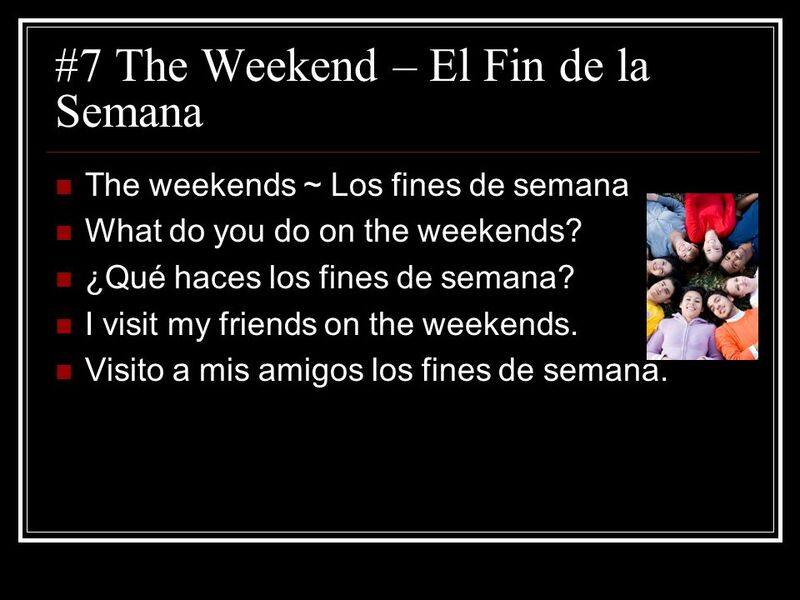 The weekends ~ Los fines de semana What do you do on the weekends? ¿Qué haces los fines de semana? I visit my friends on the weekends. Visito a mis amigos los fines de semana. 8 1. What do you do on Wednesdays? 2. On Wednesdays, I practice sports. 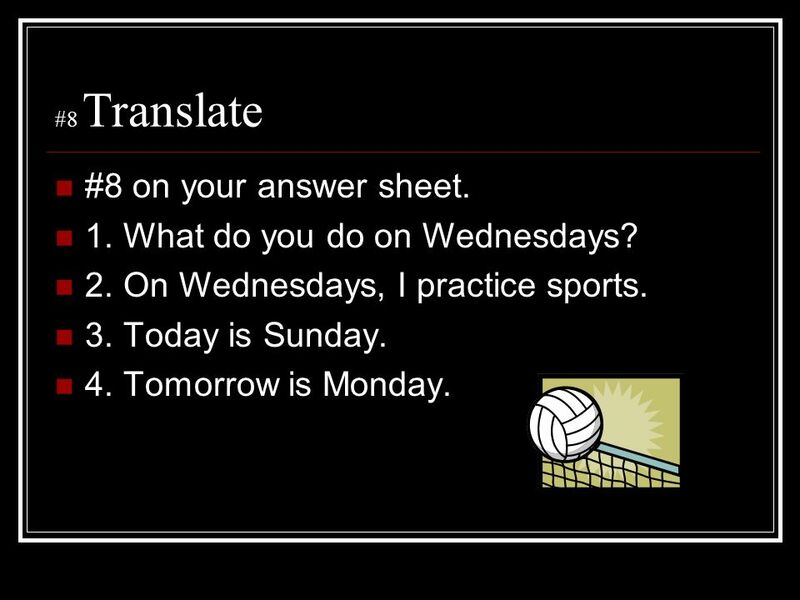 #8 Translate #8 on your answer sheet. 1. What do you do on Wednesdays? 2. On Wednesdays, I practice sports. 3. Today is Sunday. 4. Tomorrow is Monday. 9 1. ¿Qué haces los miércoles? 2. Los miércoles practico deportes. #9 Check Your Answers Correct any errors. 1. ¿Qué haces los miércoles? 2. Los miércoles practico deportes. 3. Hoy es domingo. 4. Mañana es lunes. #10 on your work sheet. 1. What do you do on Thursdays? 2. Tuesday, I go to my job (mi trabajo). 3. Today is Saturday. 4. Tomorrow is Friday. 5. I go shopping on the weekends. 11 Check your answers before you turn your paper in. 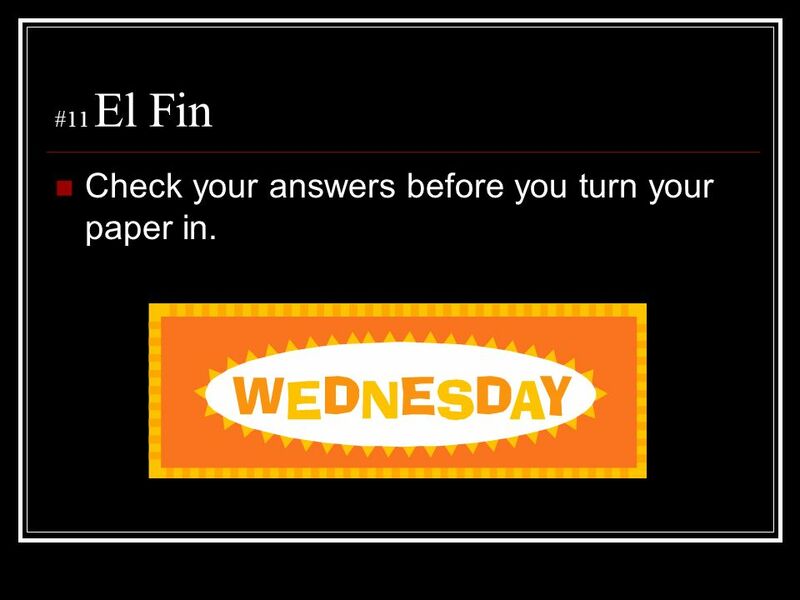 #11 El Fin Check your answers before you turn your paper in. 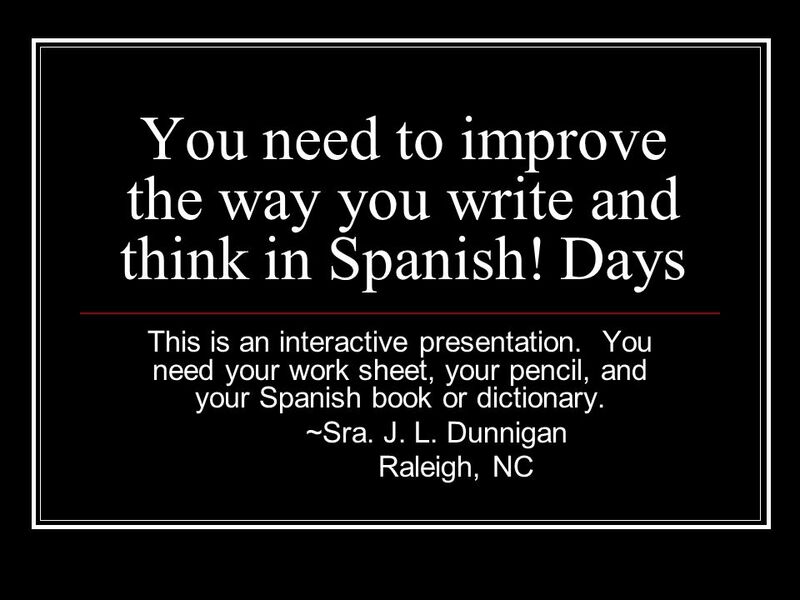 Descargar ppt "You need to improve the way you write and think in Spanish! Days"
El calendario Los dias, los meses, la fecha, etc..
Days, months, seasons, and more!. Hoy= Mañana= El día = La semana = El fin de semana = El mes = La estación = El año = Ayer – yesterday Fue - was today. Para Empezar p el calendario calendar la fecha date. Los Días de la Semana. María Scott Days of the week In Spanish, the week begins with Monday, not Sunday as in the United States. The days of the week. el calendario calendar la fecha date la semana week. Los d í as y los meses Days and Months. ¿Qué día es hoy? What day is today?